I thought I’d do something a bit different, considering this entire season will be a departure from the usual, and talk about the behind-the-scenes mechanics for some of these episodes. I’ve never done this before–except within the ASF discussion forum, of course, usually in response to reader questions. This new format seems to cry out for more rumination, or maybe it’s just me navel-gazing that makes me think so. Readers should read on with caution; I’ll be talking about stuff assuming you’ve already read the episode in question. There won’t be any spoilers for future episodes, I promise. 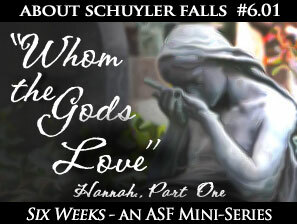 Still, suffice it to say, go read Episode #6.01: Whom the Gods Love, Pt. 1 before continuing. I thought it might be interesting to explain how I put these episodes together. Normally when there are as many secrets to be revealed in a season, I don’t like to show the cards in my hand, so to speak; unlike the major third season revelations, the ‘twists’ in these various plots don’t require me to keep silent. Like the episodes they are self-contained and I don’t think there’s any risk of me giving anything away too soon. So, about this episode. It was the almost serendipitous decision to start with Hannah’s story that made the miniseries and its one-storyline-per-episode concept gel for me. After I began work on it, the whole thing felt possible and, in fact, ideal for the stories I need to tell after the events of the last season finale–as well as a unique way to maintain suspense regarding everyone’s fates. As a result of the tragedy, Hannah is so tightly focused on her family (understandably) that I could avoid revealing what happened to other characters, because she’s not paying attention to anyone outside her loved ones. Now it’s not contrived that she doesn’t ask about certain people, or that the readers aren’t told the results of all the endangered lives during the wedding massacre. I originally started with Hannah simply because her arc is the most tightly contained–every single scene of 15 (counting both this and #6.02) is from Hannah’s perspective. I figured: okay, if the readers buy this premise after jumping in with both feet, they’ll probably stick along for the bulk of other episodes that don’t have as narrow a focus on one person. Also, in a very real sense this was an extremely difficult episode to write; there are beats that resonate very strongly in my family history, and I wasn’t looking forward to dwelling so intensely on a woman in the throes of tragedy. And yet, once I did choose to begin the season with Hannah’s POV, everything clicked. Most of the supporting cast in this episode are only seen via her peripheral vision, as it were–so when people aren’t acting ‘normal,’ the readers can see it but Hannah has a perfectly understandable explanation for not digging into what’s going on outside her own bubble. Obviously the primary person who’s acting unusual is Cameron. Now here’s a character I’ve never delved into at all in any real detail. He’s probably the biggest cipher in town, perhaps second only to Cynthia Stanford and Cam’s son Simon. (Considering that unlike those two, Cam’s a rather major figure in town, a puppetmaster pulling multiple strings, I admit this has been an egregious omission.) But even so, I think it’s clear that the readers who know enough of his self-contained, cool character to see that he’s acting… off. Hannah notes briefly how run-down and almost unkempt he is in her first scene with him (where they’re visiting Nick), but thanks to her grief, fear and anger, she doesn’t stop to consider why he’d look this way; even though she knows he and Nick aren’t particularly close, so it’s not as if he’s likely all broken-up about his half-brother. When Hannah finally does ask Cam about his family, I was very careful to make sure he only gave responses about Adele, Danielle, Simon and Becca. Since I want Ian’s fate up-in-the-air, having Cam mention his twins allowed me to let Hannah’s attention get diverted from things by resenting his good fortune–that Cam’s twins are basically fine, while hers are… well, very much not. From Hannah’s POV, he’s changing the subject out of sensitivity to her own mood. But with benefit of hindsight (once the end of the installment arrives and we learn something very bad seems to have occured with Ian), the rationale for Cam’s reticence is now clear. He doesn’t want to bring up Ian because it’s a painful subject and he doesn’t want to show such vulnerability in front of Hannah. It’s only when Hannah blasts him to pieces at the funeral and accuses him of not caring about his family, or at least not caring about protecting them, that Cameron finally lets down his guard. Of course, y’all don’t get to see what that is. Another benefit of the written medium! Hmm, I guess if this were a TV show the camera would cut to a wide shot and Cam’s words would be obscured or muffled. So that’s one example of how the solo POV lets me cheat you guys out of the resolution of certain plots. 🙂 Ain’t I a stinker? Eagle-eyed readers can also see who isn’t being mentioned in this episode, or who were barely there. For example, Jonnie Adair, probably the most prominent character of the final episodes of last season. This is a guy whose plans went so awry at the wedding, he’d begun to give his heart away for the first time in a decade (of real time, anyway) to Laurie only to get burned, he got shot up and at risk of being revealed as a traitor by Ross for screwing up Operation Mousetrap, not to mention murdering Lou and the crooked cop right before Ross’s eyes. But he was completely absent. This despite his working for Nick and thus perhaps being someone a reader might expect/hope to see in an episode all about Nick and Hannah’s family. We’ll eventually see Cameron’s POV and learn exactly why he’s behaving as he is (and once we’re out of Hannah’s POV, readers might actually understand and even sympathize with him), we’ll get different angles on the same scenes (e.g. the discussion between Cam, Dean, Jonnie and Nick at the funeral), and basically a whole bunch of different storylines will dovetail like pieces of a jigsaw puzzle. Actually a jigsaw is a great analogy. One might find a piece that seems blank except for a little squiggle on one of the “outtie” pegs. (Okay, I don’t know the technical term for it, sorry!) Only once you find the matching pieces and insert that little squiggle can you see the full context and understand its role in the bigger picture. But in the end it’s that puzzle thing that made me stick to this option. I love logic puzzles, games, riddles, optical illusions, and other things that “trick” people in clever ways. I enjoy being tricked and taking on the challenge as a reader/solver — and I like doing the same from the other side of the bench, so to speak. In short, it’s another way to have fun and challenge myself, and if it helps me tell the best story I can–and where Hannah and other similar arcs are concerned, I’m certain it has–then the experiment will be worth it. I’ve yammered on long enough. Thanks for reading and please let me know your thoughts.